Keep an eye out for “Fat Chick Quips”! Reduction does mean to make smaller. But sometimes, like when you’re cooking an AMAZING sauce, reduction means to distill or to concentrate. You take 2 cups of wine, and “cook it down” until it’s one cup of concentrated wine-flavored yummyness. 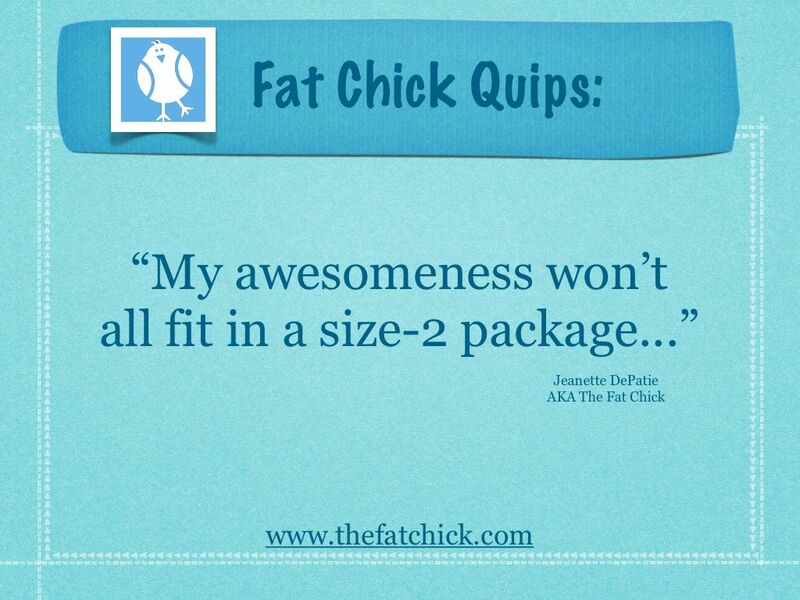 So in honor of our discussion on reduction this week, I”m pleased to launch my “Fat Chick Quips”. These are pithy little sayings that “boil down” ideas about loving and honoring our bodies into short, little quotes. These are great to share (via your favorite social media spot) with your friends who might need a little pick-me-up. And since I KNOW y’all are brilliant, if you have any sayings that you’d like me to put out in this format, I’d be honored to include them. I’ll be happy to credit you. Just send me an email at: jeanette at thefatchick dot com with your short quotes. So my little chicklettes, keep an eye out on facebook and Pinterest and Tumblr for more Fat Chick Quips. And don’t be shy! Send me some of your pithy, super awesome sayings right away! This entry was posted in Uncategorized and tagged body acceptance, Concentrating, Facebook, Fat Chick Quips, Pinterest, Reducing, Reduction, size acceptance, Size Diversity, Tumblr on July 31, 2012 by fatchicksings.